1st Nov: On my way! Left home in the capable hands of Campbell and Scott who kindly look after the house and our two precious Dogs, Cazzie and Ziggie. Simon did us proud driving me Pete and Farrel down to Heathrow to get the Virgin flight to Cape Town. We touched down in CT at 11.00 am on time and with our 160 Kg of kit intact, Virgin were great and very efficient. 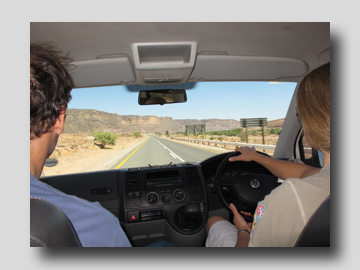 We picked up our rental VW Transporter from Kennings and we were on our way to Luderitz 1200 km away. 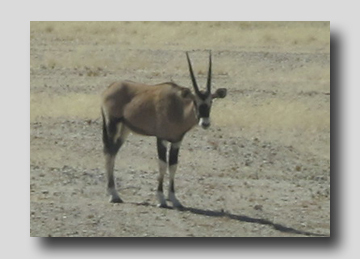 We have stopped at Springbok to overnight and will continue tomorrow only another 900 km to go. 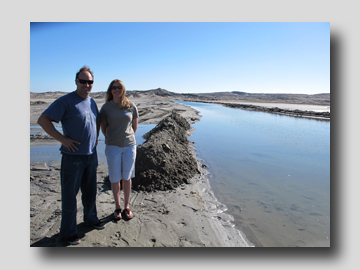 Arrived just after 4 in afternoon and went straight to the site to have a look at the new canal. I must say I am impressed, it is wider than I thought it was going to be and the entry and exit look well designed. All we need now is some wind to test it. Wind forecast looks light till Tues/Wed when we are hoping for 30 plus knots. Great opportunity to get our kit sorted and rigged over the next couple of days and the opening Ceremony is Sunday. I am also trying to raise some money for a very worthwhile charity based in the UK called Za who are building a library here in Africa please if you like reading my Blog support this charity, the link to donate is. HERE. Opening ceremony yesterday (Sunday) by the Mayor Of Luderitz, Susan Ndjaleka the we were introduced to the local committee who all made us very welcome. I also met Eleanor the only other female competitor who was very friendly and looking forward to her 1st speed event after doing so well in the PWA Slalom (Yes she is the one on tip toes next to me). Some of the other entrants arrived including Anders Bringdal the Mistral boards head man. Antoine Albeau fresh from winning the PWA Slalom and lots of old friend from the speed circuit. 1st day of official competition today and of course the day started with no wind and official timing cancelled, so breakfast in Diaz coffee shop then rigging, sorting out kit was the order of the day. But by 3.00 the wind had filled to 18 to 20 knots and with a good forecast for the following day. I took the opportunity to have the 1st run down the course! Being the first competitor down the run was a bit daunting but great fun and will help with the nerves tomorrow. The rumors are flying around about what equipment will be tried in this new, including a Tandem and Asymmetric speed boards. Watch this space! What a fantastic start! Zara Breaks both her British and Production records with a 40.95 knot run. 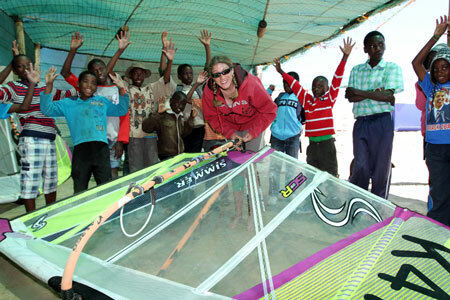 She is one of only three women ever to go over 40 knots and is just 0.3 of a knot off Karin Jaggi's record. Lena from Turkey on her 1st speed event did very well also with 39. 73 knots. Anders Bringdal her fellow Mistral rider and head man was also on fantastic form. He took the fastest spot of the day from a very strong field. What a great day! 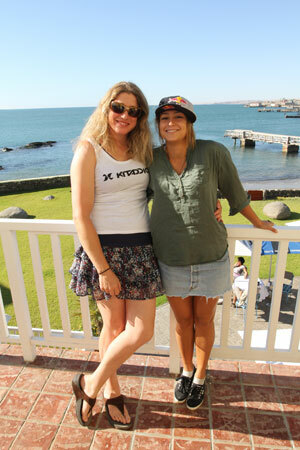 Zara broke Karin's record on her 1st run then went on to 44.19 knots. Antoine also broke his own record and took it to 49.33K. Team Mistral did good too Anders 48.33 Farrel 46.15 knots. 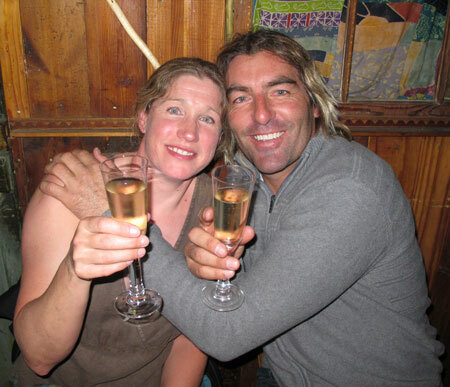 Antoine Albeau and Zara after both breaking the Windsurfing World speed records then it was off to Barrels Bar for some well deserved Champaign. "Thanks to everyone for their support and thanks on email and facebook. It is much appreciated. What a great day for everyone congrats to all on PB's, 7 National and 2 World records. Special well done to Lena on her 1st speed event, she goes in to the 40+ women's club and the Turkish Record and Antoine on breaking his 2007 record "
Not as windy as the 7th but some of the gusts were strong and if you could get on in front of one, then you could go quicker. Unfortunately for me I seemed to get much higher peaks but I was not able to convert these into fast 500m runs. I still managed 43.79 knots so not unhappy. Anders managed to up his production and Swedish record to 48.60 and Dieter Gerichhausen broke the German Record again only to have it snatched again by fellow countryman Christian Bornemann with 44.41 and for the 1st time for for him he was ahead of me and didn't get "CHICKED". Lena also upped her Turkish record with a great run at 42.6 knots. 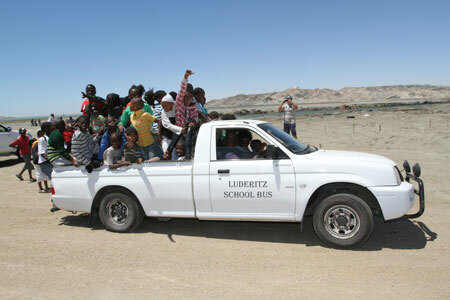 We have had a lot of requests for what equipment we are using here in Luderitz. So Anders and I have put a short video together to answer some of the questions we have received. Hope you like it and sorry for any blatant plugs. Expectations were high today and early runs were quick. Cédric Bordes then broke the world record of his fellow countryman Antoine with a 49.66 knot run but this was to be short lived. Swedish record holder Anders Bringdal now sailing on Pryde sails was next up to break the world record and was the 1st to brake the 50 knots barrier twice, with 50.41 and then 50.46 knots. Improving the world Record on Production Board as well! 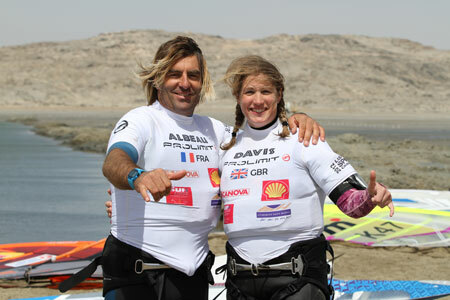 After that Antoine Albeau really put the hammer down with blistering run of 50.62 knots recovering his position of World Record holder in Windsurfing, was there Pryde team orders? Did he get a radio message "Antoine is faster than you" message? we will never know. More importantly of course Zara has broken her record again. 44.92 knots. Unfortunately she had a crash on her last run, after the finish line slowing down was hit by a gust and hit the mast and needed stitches to her head. She is fine and raring to go again on Friday the next windy day. Zara has had a lot of requests for information on what the runs are like so we have put together a great video of a typical run her in Luderitz, check it out. History repeating itself again! New world record then a trip to hospital! 17/11 Zara breaks her own record again taking the women's World and Production record to 45.84 knots she then changed down to the 5.0 m and cut her leg after finishing the run and missed two hours in the hospital having stitches in her leg, which was the windiest part of the day. This left the door open for Lena to go faster than Zara but was just short of her world record with 45.73 knot run and a new Turkish record. Zara says "I will be back on the water tomorrow for sure, I don't want to miss out on the opportunity to take the women's record higher, for sure if I had been there this afternoon I would have done "
In the men's fleet Antoine Albeau, after having smashing the 50 knots barrier several times reached 51 knots twice, ending with the best performance of the day, registering a New World Record in Windsurfing: 51.69 knots. Anders Bringdal was battling with Antoine again over 50 knots. Both of them reached 51.34 knots on the same time at one point before Antoine went on the 51.69. Anders improved the Swedish record and the World Record on production boards with his 51.34 knots. (Pryde team orders again?) Farrel has also broken his British record again taking it to an amazing 48.82 just behind the big boys. I am sure he will break 50 knots before we go home. 18/11 Lighter winds today and no records broken, so Zara took the opertunity to rest her poorly leg for the stronger winds forcast later on this week. The wind has not being playing ball for a while now and the month is drawing to an end. We were joined by the local kids on the weekend, who were fantastic and very enthusiastic about us being here. I wish some British kids could see how well behaved and polite they were! The lack of wind has given me a chance to rest my leg which is a bonus but the chance of increasing my speed seems unlikely now as the only wind forecast is for Thursday (Tomorrow) and it doesn’t look that strong. After that I think we will all be heading south to Cape Town and home.